Vinnie Paul has died at the age of 54, it’s been announced. The news was confirmed on Pantera’s Facebook page, which issued a short statement this morning. It reads: “Vincent Paul Abbott, aka Vinnie Paul, has passed away. “Paul is best known for his work as the drummer in the bands Pantera and Hellyeah. The drummer was born in Texas in 1964 and went on to form Pantera in 1981 with his brother Dimebag Darrell Abbott and vocalist Terry Glaze. They later brought in bassist Rex Brown and, after recruiting frontman Phil Anselmo, went on to achieve massive success, selling over seven million records in their career. Their fourth album – and first with Anselmo – Power Metal (1988) saw them switch from their glam metal roots and move towards something heavier and darker. Fifth album Cowboys From Hell defined the 'groove metal' style they became known for. 1994's Far Beyond Driven went no.1 in the US and Australia and no.3 in the UK. They became one of the most influential bands in modern metal, inspiring acts from Five Finger Death Punch to Hatebreed, Lamb Of God and even Korn ("The first metal band I ever listened to were Pantera," said Jonathan Davis. "Those grooves were so undeniable”). The band split in 2003, with Vinnie Paul and Dimebag forming Damageplan and released the studio album New Found Power in 2004. Tragedy struck later that year when Dimebag was shot and killed onstage during a Damageplan gig in Ohio, on December 8 by gunman Nathan Gale, who also killed three more people and injured seven others that night. Subsequently, Vinnie Paul joined Hellyeah, with the band’s 2016 album Undeniable featuring a previously unreleased recording by Dimebag on a cover of Phil Collins track I Don’t Care Anymore. 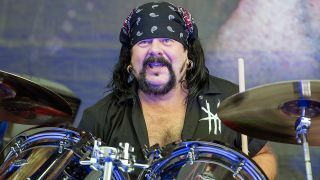 As a young man, Vinnie Paul learned the drums by playing along with his favourite records. He told Rhythm magazine last year: “Playing along with badass records is how I developed my groove. John Bonham always had the best groove ever, and he had the best feel. Phil Rudd is another amazing groove drummer – he just laid it down and made it simple. Despite that, he first met Pantera bassist Rex Brown in a jazz band. Vinnie put Pantera’s unique ‘groove metal’ sound down to the way that he played with Dimebag, rather than the bass player. “I don't ever have any bass in my monitors at all,” he said. “I like to lock in with the guitar. To me, metal music is about the guitar and drums locking in and operating like a machine together. After the murder of his brother, Vinnie had 18 months out of the music business. “Music has always been huge to me,” he said. “After what happened to my brother, though, I didn’t know if I would play music ever again. I took a lot of time to collect my thoughts. After losing him it was very, very difficult to learn to do things on my own without him. It was difficult to step into music and create music without him. Vinnie is currently ranked 9th in Ranker’s crowd-voted Best Metal Drummer of All Time list. Megadeth’s Dave Mustaine posted a message saying: “I just woke up in Belgium to the news that my friend Vinnie Paul has passed away. Another metal hero taken too soon. Say hello to Daryl for me. Rest In Peace, my dear friend." Black Sabbath bassist Geezer Butler said he was “shocked and saddened” to hear of Vinnie’s death, and added: “A true original. Had some good laughs when we toured with Pantera. Gone too soon."